that allows you to build websites for any purpose. Yes, from blog to corporate mega portal. Check our front-end or admin dashboard (login: admin / password: admin) demos to see it in action. Track development progress or take part in it. Take part in development! Propose features or report bugs here: Subrion Github. Take part in our growing community. Ask question or share your extensions. 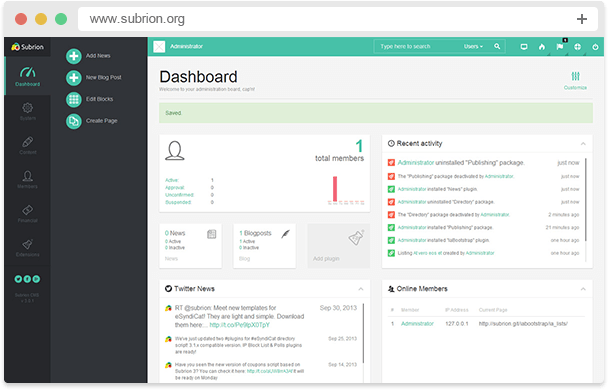 Subrion CMS 4.2 is officially announced! https://t.co/hiop1dwln1 We recommend to use 4.2 core! Realty Classifieds + Articles packages have been released for #Subrion #CMS 4.2.x More features included! Comments, Banners, Claim Listing #plugins are updated for #Subrion #CMS 4.2.0! Please use the updated versions! Subrion #CMS 4.2.1 is available now! Please note your version should be 4.2.0.10 to have a way to upgrade to the latest version. Subrion 4.2.0.10 auto update patch has been released! Please check your Settings / System and make sure auto apply is On for auto updates. Extend free cms core with powerful packages. Check more details about Subrion premium extensions. Got an idea of new project?